Every time I get out of the shower, I always see little white flakes on my legs when I dry off. In Vegas we are fighting the dry heat and the hard water, it wreaks havoc on skin, hair, and nails. I knew I needed some serious moisture beyond my usual Bath & Body Works products or Suave lotion. 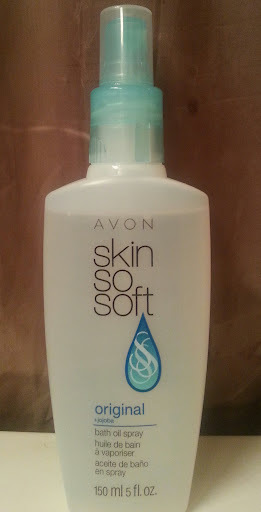 I was browsing the Avon store at the mall and knew I’d found what I was looking for when I found the Skin So Soft display. This old-school classic has held up for a reason and has a cult following that will sing its praises. I remember as a child my mom would let me use any of her bath products EXCEPT her Skin So Soft bath oil, which was her little luxury. A cap full in the tub will make your bath luxurious and your skin silky. It’s oil though so too much will make your tub super slick so be careful. I opted for the spray for easy application and less mess. Surprisingly, it’s not as greasy as I imagined. A few sprays go a long way and it really penetrates skin without leaving you feeling like an oil slick. The smell is lovely too (I have the original scent), I went to the leasing office in my apts. after I showered and the lady in the office said I smelled like a baby. If you’re not into oils, Skin So Soft also comes in a lotion and a gel. A surprising bonus is that Skin so Soft oil is also really great for keeping mosquitoes away, It’s also a great moisturizer for your pet’s coat and skin and will keep fleas away. Don’t believe me, just Google it. No one knows why exactly this repels bugs so well, it has to be something in the oil. If I ever go camping again, I’ll have to remember that but I love it for how silky soft and hydrated my skin is after I apply it. If you’re battling dry skin, give it a try. I paid 6$ for my bottle. You can find Avon kiosks in just about every mall in America or chances are your coworker’s aunt’s daughter sells it. Thanks, I’m loving the list already.